You wouldn’t go spend years developing a program, a rating system if you will, and get all sorts of input from a diverse group of industry experts, and have multiple rounds of consensus, if some of what you were proposing was not even possible, would you? Errrrrrr, the answer is apparently yes. While it has now been in the market for over 1.5 years, LEED v4 still offers up a number of credits in the Materials category that cannot be earned in the marketplace. In fact, according to both our own anecdotal evidence, and the much more rigorous efforts of our friends at BuildingGreen, a full 50% of the points for material selections cannot be earned. To be fair, it is 3 out of 6 points, but still, what the heck? 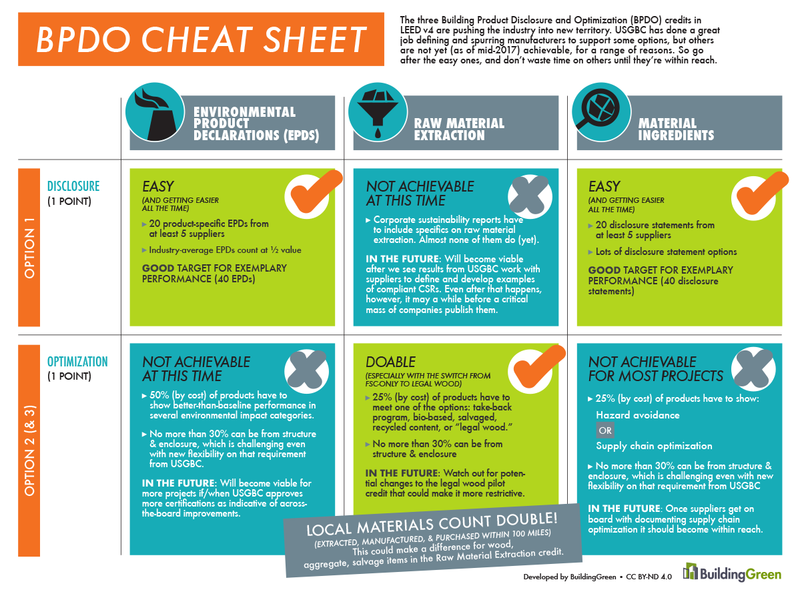 Check out the infographic below or download the Building Green BPDO Cheat Sheet.